Hair loss is normal. There is nothing to worry about when you see some of your hair sticking to your comb or brush, or simply falling off when you brush your hair; it happens to everyone; we lose an average of 90 hair strands every day. This is the result of the death of some strands. It may sound shocking but hair also has a life cycle and when a strand has reached the end of the road, it will fall off. If you think you are losing too much hair, then you have to take steps to keep from losing more. Excessive hair loss can be caused by many factors. Unhealthy lifestyle, unhealthy diet, stress, hormonal changes, vitamin deficiency, maintenance drugs and other medicine, menopause, and thyroid problems are only some of the culprits. It is a good idea to go over these factors for you to find out the possible reasons you are losing some of your hair. Sometimes a balanced diet, regular exercise and adequate sleep can do wonders. A balanced diet would ensure that you get all the nutrients to achieve a healthy body and hair. You no longer have to worry about vitamin deficiency. Exercise can help you deal with stress better. Lack of sleep can cause plenty of health problems and stress can take over your body and weaken your immune system. Pre-existing health conditions would have to be dealt with differently because if you have heart disease, for example, there is no way you can stop taking maintenance meds. The importance of a healthy diet can never be stressed enough. If they say you are what you eat, you can also say that your hair is the product of your diet. Bear in mind that if you eat the right food in the right amount, you will definitely be healthy, including your hair. Sometimes, all health problems, even hair loss, is only because of the lack of nutrition. Protein is the main composition of hair, so it is the single most important nutrient your body should have. Eggs, milk, soy, cheese, lean beef, yogurt, salmon, and chicken meat are good sources. Zinc is a protein builder and it enhances tissue growth and repair. It is interesting to note that zinc deficiency is a major cause of hair loss. To get some zinc in your body, eat nuts, pork, chicken, spinach, crabs, lean beef, pumpkin and wheat germ. Take vitamins A and C because they increase rapidly the sebum production. However.Sebum is an oily basis secreted by the smooth hair follicles to stop hair fall. Carrots, sweet potatoes, lettuce, spinach and collard greens are good sources of vitamin A. Vitamin C can be found in oranges, pineapples, papaya and broccoli. Iron is the body's oxygen carrier. If you have iron deficiency, it means you are not getting enough oxygen to your head, resulting in poor circulation of blood. The result will be hair loss. To make sure you have adequate amounts of iron, you must eat red meat, egg yolk, turkey, liver, beans, oysters, dark leafy green vegetables, and dried fruits like raisins and prunes. Massage helps prevent hair loss because it boosts the flow of blood to the scalp. As the blood flow to the follicles is increased, the scalp is conditioned and ultimately the hair roots are strengthened. 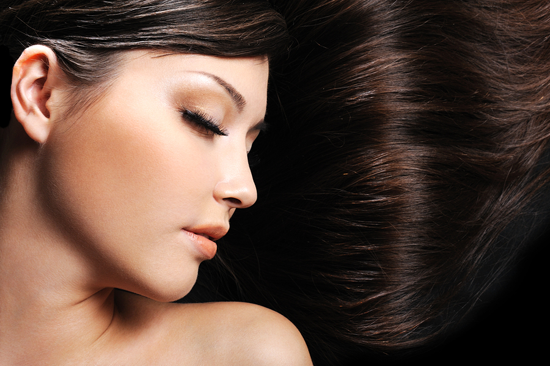 In addition, more nutrients can be absorbed by the skin as a result of the warming of the scalp. It is also important to note that hair needs nourishment in order to grow and stay healthy and strong. Since massage conditions the scalp, dandruff is also prevented. Dandruff is also another cause of hair loss. Lastly, massaging the scalp is relaxing and stress-relieving, so you are fighting off stress, too. Some of the most popular scalp massage oils are coconut, olive, almond, or even the extract of lavender, rosemary, and even geranium oil. The hair is any person’s crowning glory. Any alterations done on the hair such as haircut, color, perming or straightening causes a huge change. Some of these methods make the hair appear beautiful and attractive but this appearance is just temporary. After a few days, the hair tends to dry and become difficult to manage. This is because, chemicals and devices can ruin the hair. If you are concerned about the health of your hair, use these tips to bring your hair to a better condition. Healthy hair can be achieved in four major steps. Cleaning the hair during shower is an essential step in fulfilling good hygiene. However, washing frequently can also be the cause of damage. It is important to determine the condition of your hair in order to know the frequency of washing. For individuals with oily hair, washing must be carried out regularly but those with dry hair, washing should take place three to four times a week. Read labels of shampoos and conditioners before buying them. Choose products that fit your hair type. When it comes to drying your hair, avoid using the towel to dry it out. Use the hairdryer sparingly to avoid severe dryness and split-ends. Condition the hair at least once a month with natural products to maintain its healthy glow. However, you have to use the right products to ensure that you get positive results. The combination of olive oil and egg is good for persons with dry hair. You only need three tablespoons of olive oil and two eggs to prepare the mixture. Apply this onto hair for 20 minutes and rinse off after. Apple cider vinegar and lemon are good for oily hair. Mix ¼ cup of apple cider vinegar with one whole lemon scraped and apply the mixture onto hair for 15 minutes then rinse off after. For those who encountering flaky scalp problems, use banana honey and almond oil. Mix a few drops of almond oil with two tablespoons of honey and one-half mashed banana. Apply the mixture and sit for 20 minutes using a shower cap. As you can see, all these products are natural therefore, you don’t need to worry about damage or harm to your hair. What you eat can greatly affect the condition of your hair. If you want to maintain a healthy and vibrant hair, stay away from junk foods and sodas for they do not carry any good nutrients for the body. Here are some suggested food products which promote healthy hair and scalp: salmon, walnuts, oysters, eggs, sweet potatoes, lentils, spinach, yogurt, blueberries and poultry products. For healthy hair supplements, these are the top five vitamins: vitamin A, vitamin B5, vitamin E, Inostol and Biotin. Make sure to check with a hair care specialist if these supplements are suitable with your diet. As a rule of thumb, have your hair trimmed every six to eight weeks. This will eliminate dry tips and allow the hair to grow healthily. Wear a hat when the weather is hot. The UV rays of the sun can cause damage to the hair. Avoid stress and obtain quality sleep. With all the many shampoos and enhancements available in the market today, people, especially women, get influenced easily. It is worth noting that some products may be effective to a number of people but can be harmful to others. Since the hair is considered an extension of the epidermis, it is best to consult with a dermatologist or hair specialist. Keeping your hair healthy is not about buying the most expensive product there is, it is a matter of using the right method of care and natural products.